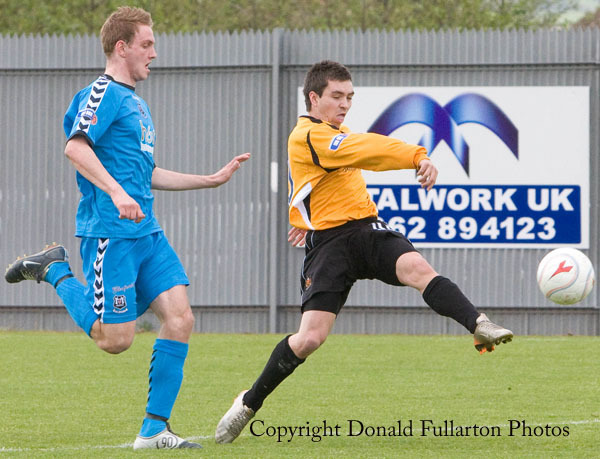 DUMBARTON became the champions of division three in remarkable style at the Strathclyde Homes Stadium. Derek Carcary opens the scoring. A 6-0 win over bottom of the table Elgin City left them three points clear of East Stirling in second place with one game to go, with Sons having a goal difference of +27 and Shire +9. Title challengers and former leaders Cowdenbeath could only draw at home to Forfar Athletic and slipped to third place. On the field it was the Derek Carcary show, with the young striker — who had his early football at local side Leven Thistle — becoming the first Sons player to hit four goals in a league match for 30 years. Another milestone was reached midway through the second half when Dumbarton passed the club's long-running record for the longest period without conceding a goal, thanks to keepers Dave McEwan and Mark McGeown. Carcary opened the scoring, then Denis McLaughlin added no.2, then Carcary completed his hat-trick to make it 4-0 at half-time. After the break he added his fourth, and shortly before the end the hard-working Stevie Murray netted no.6. Once the Cowdenbeath result was confirmed, the celebrations began in earnest.